One thing the recent Bat flicks have had going for them is the level of pulling power they have had in getting together a-game stars to play even characters as far down the pecking order as Lucius Fox. While I'm of a belief no film with Morgan Freeman in ever goes down badly, today's news that Anne Hathaway (Alice in Wonderland) will be playing Selina Kyle in the upcoming Dark Knight Rises doesn't hurt none either. Now normally I'd also stick up a pic of their adopted comic book role, but if you can't see Catwoman in this photo you might be suffering from a little more than cat-scratch fever. 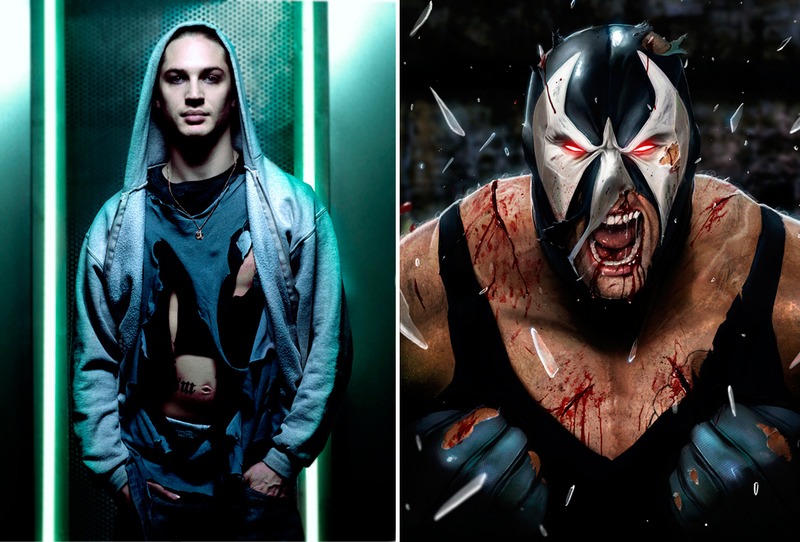 As for Tom Hardy, announced a while back to be part of the third bat-flick, comes word he's taking the role of the guy who broke Batman's spine - Bane. Great news for fans of the Secret Six! Great overall casting, though i thought Tom Hardy was going to get a main villain role, i hope his role will still be strong. I'm going to put my trust in Nolan. Not sure I like the choices, but I've got an idea he's going to hit it out of the park anyway and I'll have to eat my words. That said, Nolan is owed all good faith in terms of Bat movies. So if he has crafted a good story that needs Bane, so be it. But since this is the last Nolan Bat movie, I am disappointed we won't get to see The Riddler, or Hugo Strange, or the Mad Hatter in this universe. Thanks fopr the awesome comments folks! I'm looking forward to seeing Ann play the role of Selina. The character is pretty tricky to nail in print let alone screen - so it'll definitely put her to the test. I think I picked Bane back on your blog Craig once didn't I? But I side with Rob, Riddler done right, is one of the best villains around and it's kinda sad to think he is not going to get some decent airtime. I swear if he's the cliffhanger that never gets finished on ending I'm gonna though my soda can at someone. You heard it here first folks! for %$#@&* sake Dan i was starting to wonder if Hell had frozen over! it's been to long since i had my last IADW fix! well, Anne Hathaway has thus far not made much of an impression on me either way. i only know Hardy as the evil Picard clone from Star Trek Nemisis for which he did a pretty good job even though the movie still kinda sucked. i wouldn't have thought of him to play Bane but then again i was surprised to find out Heath Ledger was to be the Joker and we all know how that turned out. like Hathaway, Ledger had never made much of an impression on me either as an actor. i didn't need Brokeback Mountain i live in the San Francisco Bay Area it's pretty broke back here all the time. so indeed we'll just have to place our faith in Nolan who thus far has not led us astray. just make sure to keep tim burton away from the set and the script. Dan, yes I believe you did call this one. I agree, I'd rather have seen Riddler or Hugo Strange. I hadn't heard about the Mad Hatter. I like that idea. I love the idea of Hathaway as Catwoman! I can't wait to see this. But why, oh why do they keep forcing Bane on us? WHY? I'm so freaking sick of Bane. Pick someone else...PLEASE. Sigh. I suppose I'll have to wait and see if he does a good job. But I feel halfway cheated out of a chance to finally see the Mad Hatter on the screen. I know what you are all are saying about the Mad Hatter - ever since Rob mentioned that I've been thinking how cool that would marry with Gotham on screen. Another I thought of last night is the Ventriloquist, he wouldn't make a core film rouge but as a support character he would be brilliant. I think we've had this conversation before. I really hope Nolan puts some of these characters in the movie, even just for a cameo during the first few minutes. Maybe a walk down the hall at Arkham passing by each of their cells. just got in from seeing TRON and i just wanted to say that Anne Hathaway doesn't have squat on Olivia Wilde! i think she looks way better as a Selena Kyle. I like the way you think Dave. Anne Hathaway. . . sigh. . . I'm all for Anne Hathaway as Catwoman - cool choice. For those uncertain of Tom Hardy's acting chops, see if you can track down 'Stuart: A Life Backwards' - he's amazing in that. Thanks again for all the comments guys! I've always seen Tom play villains Robert - apart from in Inception - so I'm thinking he could be a real hit in this role... for me the question will hang over how he bulks up when he hits the juice. I love Anne Hathaway and you guy have admited you hadn't liked Actors like Heath Ledger or Gwynet Paltrow prior to that one role, you found perfect for them. I have faith that Nolan will do a good job, as always. Still I agree with Dan about the Riddler. Sounds like a plan Aliera!